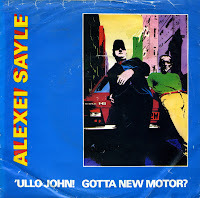 While Alexei Sayle's debut single ''Ullo John! Gotta new motor?' was a genuinely funny take on people with strange dialects saying the oddest things, I didn't quite 'get' 'Didn't you kill my brother?'. 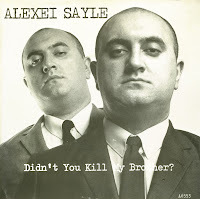 As I've only recently found out, the single was the theme song of an episode of the satirical Comic Strip TV comedy series in which Alexei Sayle plays both halves of a pair of gangster twins, not so loosely modelled on the Kray twins, the notorious Moss brothers Carl and Sterling. The episode also remakes Bicycle Thieves whilst lampooning British liberal values. Produced by Sayle and Chaz Jankel, the single was a flop. So I found the 7" single of ''Ullo John! Gotta new motor?' in 1995. I actually ordered it in 1985 from a mailorder company in England, but it was sold out. I stated the 12" single as an alternative (remember, these were the days when you actually had to send your order via snail mail and hope for your order to arrive two weeks later), and so I got that one. I was a bit disappointed, because even if the 12" single contains 'part 3' and 'part 4' of the track, it does go on a bit. According to Wikipedia, the 12" version of the single achieved notoriety due to its extensive use of profanity. After listening, I'm sure you'll agree that they are referring mostly to part 4, which contains an impressive array of foul language. 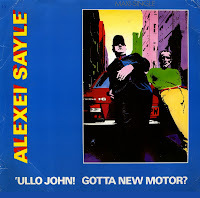 British comedian Alexei Sayle made quite an impression on me with this video back in 1984. Some kind of lunatic running through the streets, venting the most incoherent oneliners... it was great. Finding the accompanying single was a big problem though. It wasn't available in Holland, and when I ordered it in England all they had was the 12" single. It took me a decade to finally come across a copy - and of course I bought it right away.